Today is the last day of my Trimester 1 and again i say, good riddance! 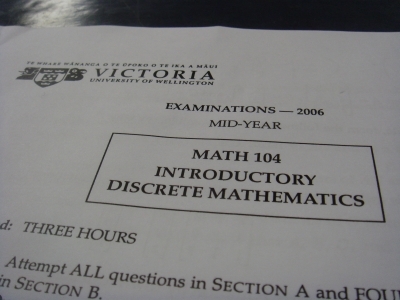 I had my MATH104 exam at 2.30pm today & jz like my ALIN201 exam it was really touched by Jesus! As usual I did not fear the exam, it walked in confidently... i could solve all the problems and remember all that i hav and even those that i hav nt studied but learnt a long time ago! Also i'd like to thank God that the questions were quite interesting & i was so absorbed in solving it that the 3 hrs passed so fast! If i get an A it will me A for AMEN!!! FEELS SO GOOD TO HAVE COMPLETED MY TRIMESTER!!! Read sum books or novels. I have always enjoyed a piece of classic fiction... my fav is Les Miserables by Victor Hugo. Get to know NZ better. Goin to South Island soon! & wana explore Wellington more wif this free time.